Capital Regiment enjoys "A Perfect Day to Learn Drill"
From the Capital Regiment Web site: Snow falling Sunday morning in central Ohio didn't keep Capital Regiment from the field this weekend. The corps journeyed to Granville, Ohio, on Sunday to learn drill at the Mitchell Center at Denision University. 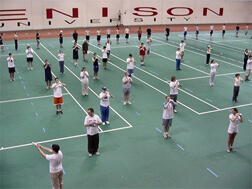 Capital Regiment rehearses indoors at Denison University in Granville, Ohio. "This is the first time in the corps' history that we have used an indoor facility to learn drill," Capital Regiment director Rick Bayes reported. "The indoor facility at Denison is tremendous. It was exciting to see the drill and music on the field in March!" The Sunday drill session was preceded by a very productive day on Saturday. Saturday evening the entire 2003 production, "A Brave New World," was played by the brass and percussion sections from start to finish for the first time. This was a particularly rewarding accomplishment for the corps, given that the February camp was cancelled due to a snowstorm. Even with the cancellation, the corps has been able to maintain its winter program timeline goals. The next camp will be held from April 25 - 27 at Walnut Ridge High School in Columbus, Ohio. Auditions for the remaining color guard positions will take place at the April Camp. All percussion positions are filled. A very few number of positions are available in the horn line.